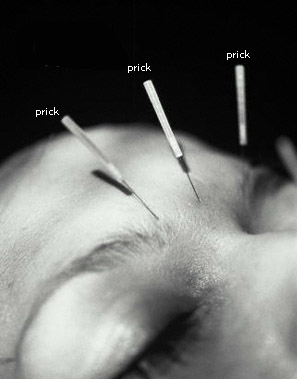 I saw an acupuncturist on Wednesday and it was a new experience for me. There was a lovely windchime right outside the office door dispelling all the bad chi or at least moving chi around. The waiting room reminded me of a hip massage place with earthy music, chimes and beautiful shaded lamps. After my paperwork was complete I was lead to one of those small cubicle rooms with more lovely music and a massage style table and it was heated!! I only found that out after I disrobed and put on an odd hospital-like gown and was able to lay down on that bed-hard and skinny but warm with nice cotton covers on it. Tara Anderson-the acupuncturist-(who by the way, was much younger than I expected!) came in and we chatted about my back and how I felt in general. She asked if I wanted to see the needles she would use and of course, I said yes. They are tiny and soft, more like a flexible pin. She quickly moved around me dabbing alcohol (i think) on particular parts of my body and she started inserting the needles at my scalp-a little pinch, yes!) but those were the only ones that bothered me. Tara continued around my body from my head she put a few in my hands, my stomach and down my legs. She said they need to stay there for 20-30 minutes, she flicked out the light and left me to meditate or sleep. I couldn't feel the needles while I was laying there and I kept waiting for some amazing flash of brilliant color but nothing psychadellic happened. The massage table was toasty warm and I think I did fall asleep for a few minutes. Then the nurse aide came in, removed all the needles, zip, zip, zip, and after I sat up, she gave me a quick little back massage. I am walking a little easier even though I still have some aches and pains. I did make another appointment for Monday evening because, even though I'm anti consummer and don't really buy into programs (other than yoga), I felt it was a positive. I liked that it was a whole experience similar to a massage and unlike chiropractic appointments, which last all of 5 minutes. So thumbs up for acupuncture! !